Confessions of an ADDiva- Midlife in the Non-Linear Lane - ADHD Women: Born to be Extraordinary! First prize award-winner for Women’s Issues in the “Next Generation Indy Book Awards.” Is it ADD or is it AGE? It might be both, as the author discovered when she was diagnosed with Attention Deficit Disorder at age 45. 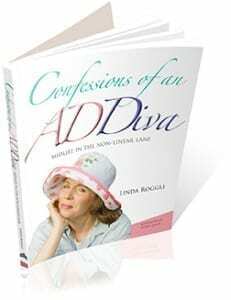 “Confessions of an ADDiva” traces her journey from denial (“Does this mean I have ‘dain bramage? '”) to acceptance (“I’ve stopped apologizing to doorknobs.”). Written with a good twist of humor and a tender dose of poignancy, “Confessions” shines a light on women whose unrecognized ADD-ish symptoms have reached a crescendo at “that certain age.” Brain fog, memory malfunction, running late to appointments, losing the car keys (and reading glasses) are only part of the fun of midlife ADD!